Fall is almost here it’s always interesting to me how my cravings change with the seasons. It’s still very warm in Atlanta, but I am already thinking about heavier foods. I use Traditional Chinese Medicine as my health regimen and if you know anything about TCM, you know that the energy of the body changes with the seasons. The body’s tendency is to put on some additional weight to keep warm in anticipation of the winter. I guess it makes perfect sense that I was thinking French Onion Soup this week! I’ve been making this soup for many years and I tried a new ingredient for this version of the recipe. Only one fourth cup of Cognac added a significant dimension of flavor to the soup and this French version of brandy will be a permanent addition to my recipe. If you’re craving soup as we move into fall, I think you’ll like this version of a classic. 1. Melt butter in a large Dutch oven over medium high heat. Add onions, garlic, sugar, and thyme and saute, stirring regularly, for 20 to 25 minutes or until onion are caramelized. 2. Add flour and mix well, Cook for two to three minutes. 3. Add Cognac and cook until evaporated. Add wine and cook until almost evaporated. 4. Add beef stock, salt, and pepper and simmer for 20 minutes. Adjust salt and pepper to taste. 6. Brush baguette slices with olive oil. Place bread on baking sheet and bake for 10 to 15 minutes or until slices are beginning to brown. 5. Change oven mode to broil. 6. Fill six ovenproof crocks with soup. Place two baguette slices on top of the soup. You'll want the bread to cover as much of the surface of the soup as possible, so you might need to trim the slices. Top bread slices with cheese. 7. Place crocks on baking sheet and broil for 2 to 3 minutes or until cheese is melted and slightly browning. This step happens very quickly so watch carefully so you don't burn the cheese. Definitely a weakness of mine. 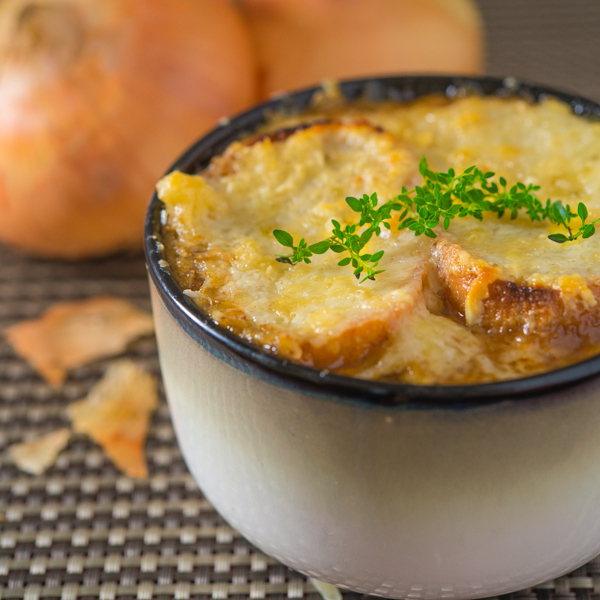 If French Onion Soup is on the menu, I’m ordering it. I’ve never made it at home for the silly excuse of not having the ovenproof bowls. I have a birthday coming up so maybe I should add them to my list because your soups look perfect. I definitely would enjoy eating a bowl of your soup! Can’t wait for some fall colors but until then, the food looks darn delicious. Thanks for the idea, looks delish. I usually add cognac to my French Onion Soup, too (an idea I got from Julia Child). I haven’t made this in ages, and like you, I’m starting to crave heavier food. And definitely soup! This looks terrific – thanks. Your food photos always look wonderful and make me want to cook or run to the nearest restaurant and just have a good meal. But what strikes me the most this morning, is in the photos the food actually looks happy to me. Yes, I am a little happy today, and perhaps that is why, But I really think it is the photo, it just looks happy to be there.